Well I have to say it, Carole and I have gone out into the world and presented ourselves as weavers. Spending the weekend hawking our wares (at the Driftless Art Fair) and actually selling some of it validates some of the time that we have spent in the studio lately. I’ll tell you, that a couple of days before the show, when I was putting in lots of hours at the loom and my feet were curling up into claws from treadling so fast, I really doubted the wisdom of weaving for profit. Now at the other end of the weekend, and a couple of days of ignoring my loom; it doesn’t seem so bad. (kind of like childbirth) I can’t help but think of my next project, and as soon as my weaver’s elbow subsides, I’l give it a go. Also Carole reminded me that if we are doing an open house in November (Nov 21st and 22nd) we’d better get busy. 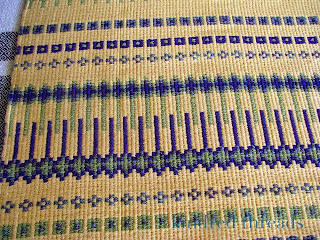 Caroles latest krokbragd is a beautiful table runner with bamboo. This little one was sure she should be walking the dog instead of the other way around. I’m so happy for you! I’m glad it went well. 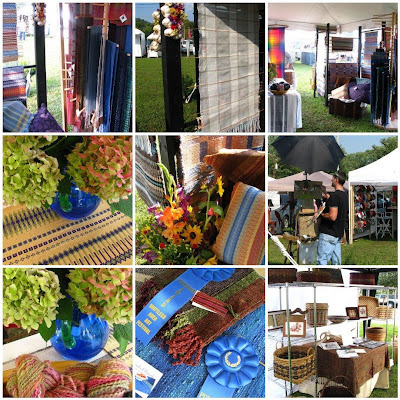 You should come to the Ann Arbor Art Fair next August! All of your stuff looks great in your booth! Your weaving looks well together, and the display was really pretty. I’m glad you had some pay off for all the effort, and awards!